Cape Farewell is the name of an arts foundation that pioneers a cultural response to climate change by bringing together scientists, artists and communicators to stimulate the production of art based on the science of global climate change. Recently I had the pleasure of accompanying them on an overnight expedition to Hilbre Island and, over a large pan of Scouse, I was invited to join them in a discussion they were having on the value of coastal landscapes to visitors, artists and scientists. There is an ongoing study into the monetary worth of coastal habitats; believe it or not people are attempting to put a “dollar value” on our coast. Not the infrastructure though, we are not talking about weighing up the metric tonnage of sand and calculating its worth, this is about something more ephemeral, abstract even. How much is the smell of the sea worth to a day tripper? What price for the feel of sand between a toddlers toes for the first time in its life? How much could you charge an artist for a lightning bolt of inspiration from a sea view? What should a birdwatcher pay to be awestruck at seeing 10,000 Knot flying in unison over mudflats? Would they get a refund if the Knot didn’t show? Could, or should, we pay for the "experiences" of a seaside visit? How do we quantify, rank then monetise peoples differing interests and activities in coastal environments? Moreover, by levying such fees on these experiences are we going to price people off the beach? Is this acceptable? Furthermore, how will climate change affect our coast and will this alter its value? Could a disgruntled kite surfer claim on a strange coastal insurance policy if their beach turns to unsurfable marsh as a result of global warming? To illustrate a negative effect of climate change I suggested the loss of Whimbrel and other shorebirds as breeding birds in this country, robbing us of the chance to see these migratory birds on the nest without making a long haul flight. 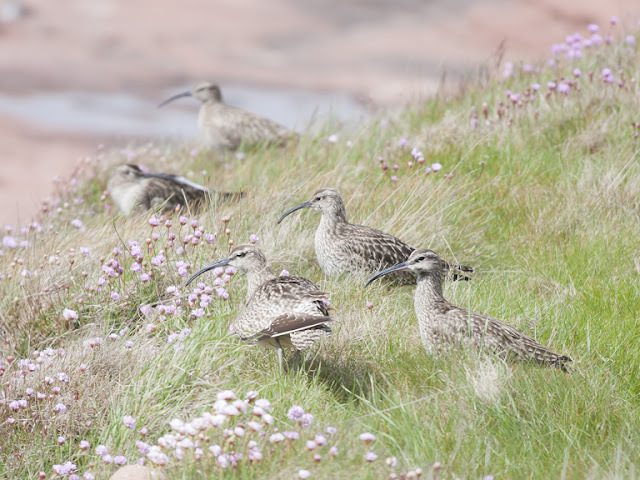 Due to the northward drift of habitats as a result of rising temperatures this could happen as Whimbrel have barely a toe-hold on suitable breeding habitat in Shetland. From the back of the room a devil's advocate says "So what?" 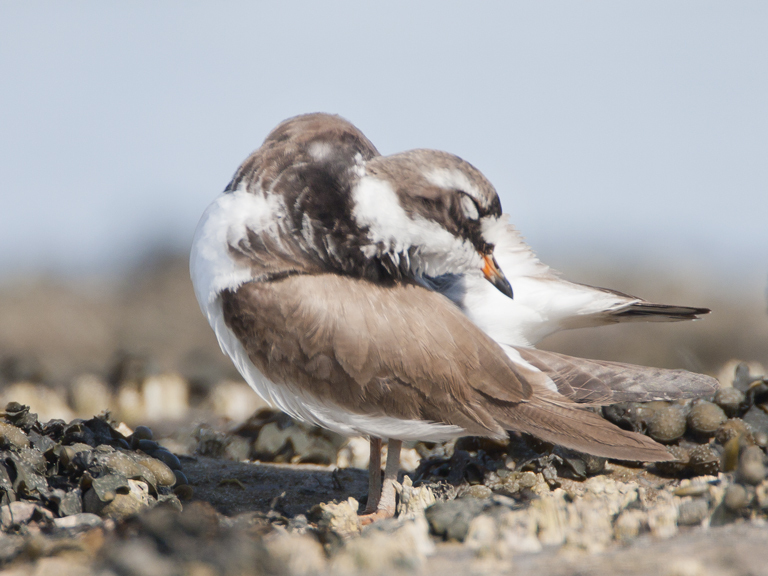 Does it really matter to the population of this country if these migratory shorebirds no longer nest on remote Scottish islands? In these times of harsh austerity how should we, if at all, value our natural heritage? 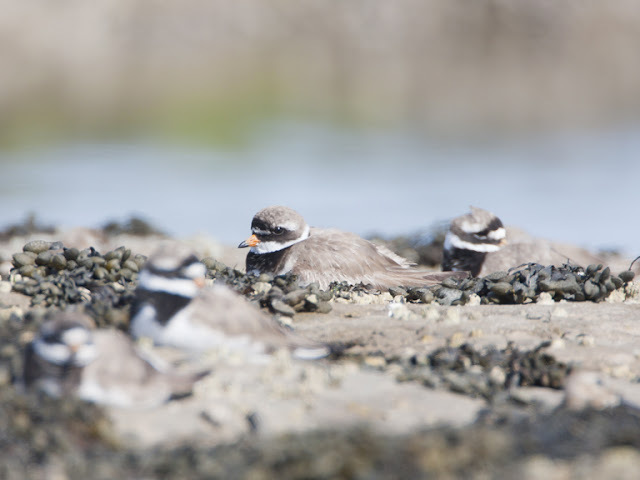 Is it wise to spend scarce funds on conserving small populations of seldom seen birds? My answer was to spend some time with the wading birds of Hilbre, to watch them, to see just what they do and how they live. Observe their inter- and intra-specific relationships. Then you should know if, or how much, you value them. A few weeks later I thought I should take my own advice and spend time with these birds. I would try to measure my responses, see how they stimulated my senses and inspired my art, in this case digital photography. Afterwards I should be able to evaluate my experience a place some sort of worth on it. So I look around for something to inspire me/photograph. Out on the rocks I catch sight of Dunlin and Ringed Plovers feeding amongst barnacles that cling stubble-like to the sandstone reefs. I carefully pick my way down the steep cliffs, making the long drop to Niffy Bay where the birds are. Before I start to take note of my feelings during this photo session I fiddle around with the settings on the camera so I can get the pictures right. Settings set, I lie down on the floor and wriggle as stealthily as I can towards the birds. The sandstone is damp and smells faintly of muddy fish (not entirely pleasant, the idea of charging someone for smelling this seems a little greedy!). Grains of the soft rock come away as I crawl over it. A Periwinkle shell becomes caught in a crease of my shirt and gets dragged along. It scrapes a calcium white line across the reef. The sun, a rare commodity this summer, is hot on my back. As I get closer to the birds I become aware that I’m really rather enjoying myself. I feel privileged to be in such proximity to them, but how much would I pay for this opportunity? Could I even afford it? Four Ringed Plovers are sat in a line that cuts diagonally across my field of view, a dot-to-dot of arctic shorebirds. They are sitting tight, like hens on eggs, perfectly camouflaged amongst seaweed. I sit and watch for a while but to be honest nothing much happens. The birds sit, some look around every now and then, others fall asleep. But this is fine, even with a lack of action it is still rewarding to be tolerated by this nervous shorebird species. Plus its still more fun and better value than some dreadful bands I have paid to see/endure. I continue to observe them. The sun we are sharing must be hot on their backs too. Others to my left are a little more active, mindful of the rest of their migration to Africa they are preening flight-weary wings. While watching this process I see the care and precision taken over every feather. Each one is stroked and teased back into perfect place with the dexterity of a thousand knitting grandmothers. However it's not all peaceful. Boisterous males close to the edge of the water are having a noisy dispute. It's not clear what its over, possibly a shellfish snack, maybe a premier roosting spot, could even be over a female. They yip and skip with furious anger, piping calls coming shrill over the pebbles to my ears. It might be an important spat for the protagonists but it is pure entertainment for me and far superior to certain films I’ve seen at the cinema. 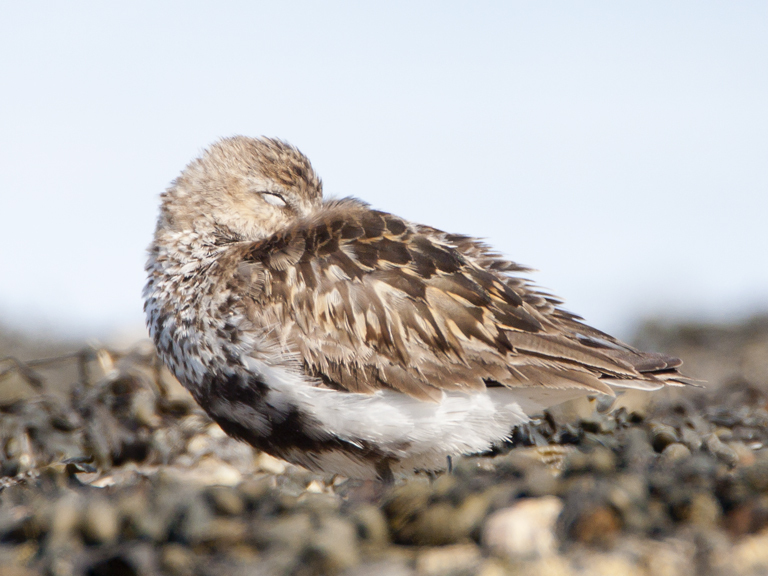 This furore has gone unnoticed by the Dunlin, they resolutely stay asleep, heads stowed under ragged wings. They actually appear relaxed, obviously feeling very secure in the confines of Niffy Bay. I’m close enough to see the tattered feathers of their wings, frayed by the huge flight from high latitudes; they use Hilbre to rest, refuel and moult into winter plumage. Some are missing the odd primary feather and a quick search of a nearby rock pool yields a couple of the discarded feathers. This is quite energetically expensive and the birds need their rest, it would be unfair to disturb them too much so I retreat a few paces. Again I sat, watched and photographed them, just as I recommended to the "so-whatters" in our losing-as-a-breeding-bird debate. So after a short period of reflection how did I feel? My over-riding impressions were of dignity and respect. Not what I expected at the start. I look at these birds and I don't see just some medium sized brown birds on a bunch of rocks at the mouth of a muddy estuary. I see their travels over oceans, across huge skies, from breeding tundra to dusty/muddy wintering quarters and every place in between. Connected, like pins in places on a map joined by string, my own version of string theory. These birds take no more than they need, just what will sustain them and their young. They work hard but expect no reward. They quietly go about the business of enduring. I imagine the journey that brought them to my Patch. From raising young on a far flung foreign land, to dodging storms and Peregrine Falcons while migrating. This makes me appreciate their efforts to get here even more. I hope as a race we don't pull the climatic rug from under them. My world would be poorer without them. Now I have to decide what all this is worth. The taste of salt on my lips, a gentle breeze felt on sun reddened cheeks, the peace of a brief separation from the fleshpots of civilisation, the sound of the terns screeching overhead and the sight of so many birds just.... being. Eventually after some careful consideration I arrive at a figure. £0. Nothing. This is not because I think it's priceless, that it is all too beautiful to put up for sale, it’s just that we aren’t the only stake holders here. 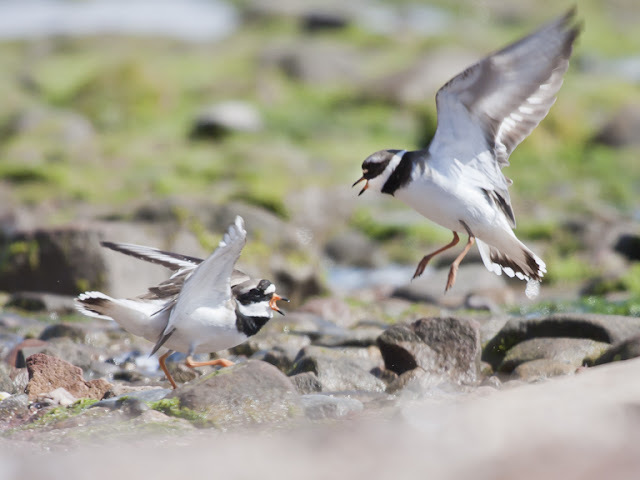 Dunlins, Ringed Plovers, Whimbrels, Grey Seals and the other members of Hilbre’s cast of thousands own these islands too. Quite simply, they aren't ours to sell.